Avalon Group’s roots in instructional design, which emphasize performance improvement, guide our approach to technical writing. We view manuals as instructional tools. Our approach produces effective documentation and distinguishes us from engineering firms, traditional technical writers, and contract writers with English or journalism backgrounds. 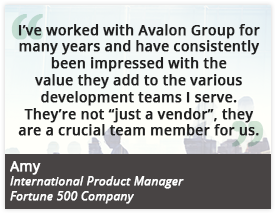 At Avalon Group, we see ourselves not only as technical communicators but translators, problem solvers, and community builders. Why translators? We work with highly technical subject matter experts, many times PhDs, engineers, or other professionals at the top of their fields, to extract information and translate it for the intended audience. Why problem solvers? We use the information we translate to solve a problem, such as how to explain a product to a customer, document the design of a product for an engineering team, or codify a process to train hundreds of employees. Why community builders? We help to form a community of discourse by listening, synthesizing, achieving consensus, and documenting decisions and processes. Being a good technical communicator is not simply about good writing – it’s asking questions, listening, and thinking abstractly to structure complex information. Our team members are creative, logical, confident, motivated, and dedicated to achieving success.